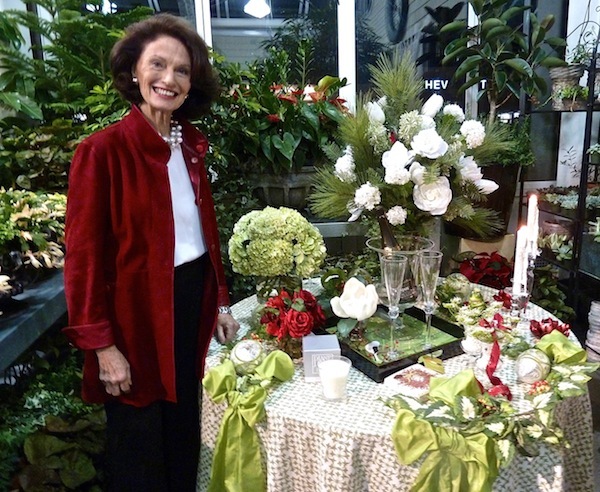 Last night marked the beginning of the seasonal festivities for me with the Home for the Holidays tabletop event at our local award-winning retail florist, Nielsen’s. All ticket proceeds benefitted the Food Bank of Lower Fairfield County to help victims of Hurricane Sandy. It was a packed house as everyone was clearly ready to start thinking about their holiday decorating. 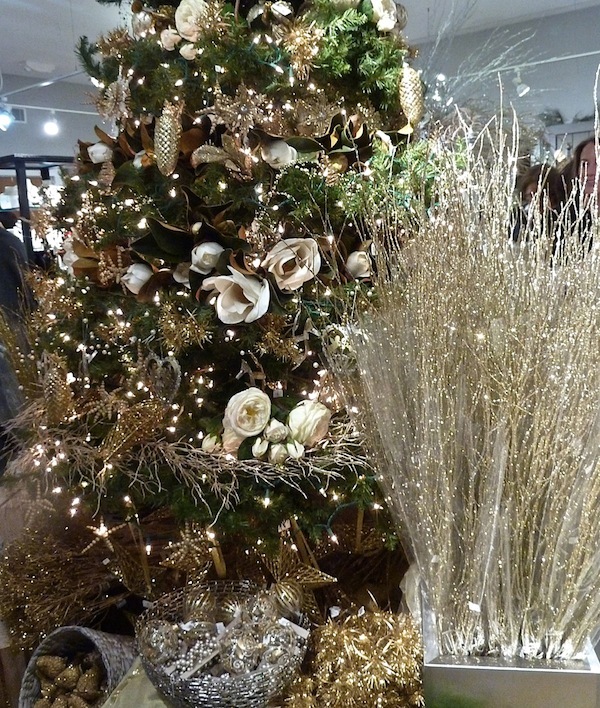 Metallics seem to be the theme this year and the store was a-glitter with gold and silver. 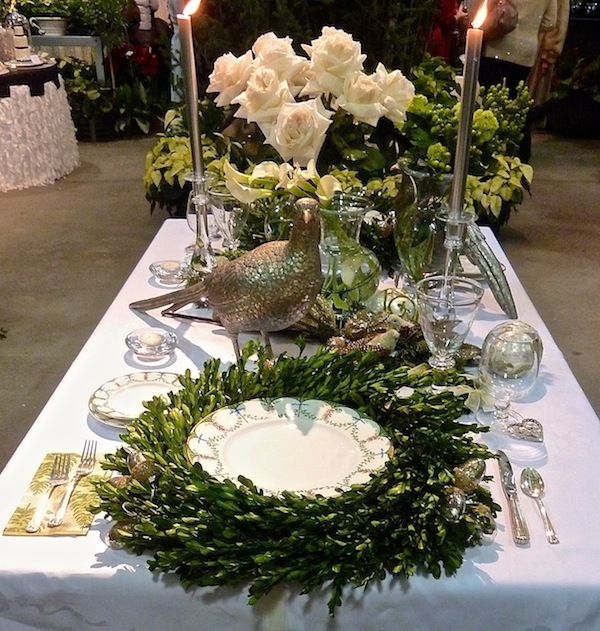 Several local designers and merchants styled tabletops for holiday celebrations. 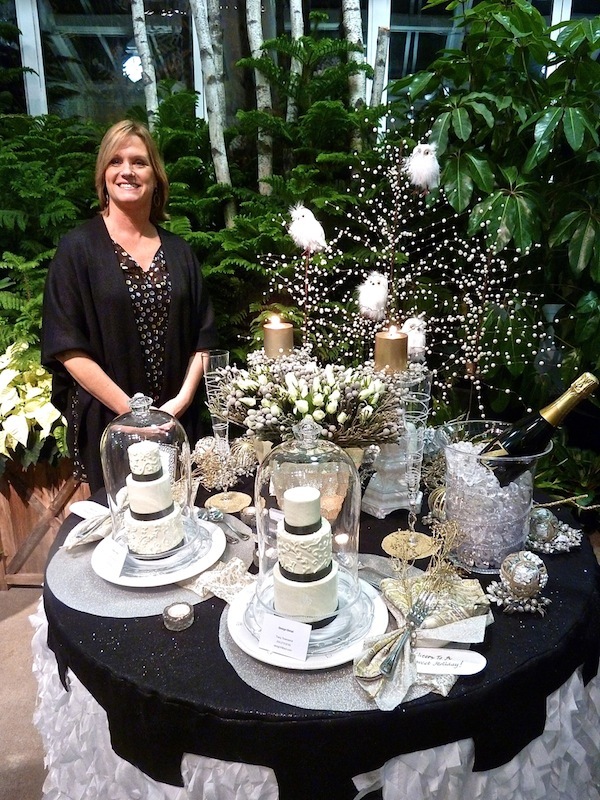 Tammy Whittier of Nielsen’s created the opening vignette with classic Raynaud Festivité Limoges and lush greenery. 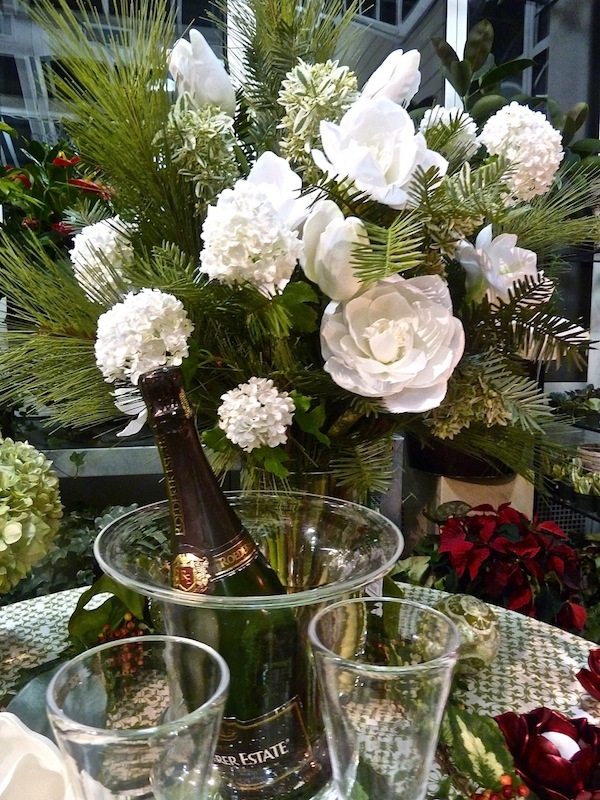 Diane James herself designed a festive drinks table with beautiful arrangements from the collection. 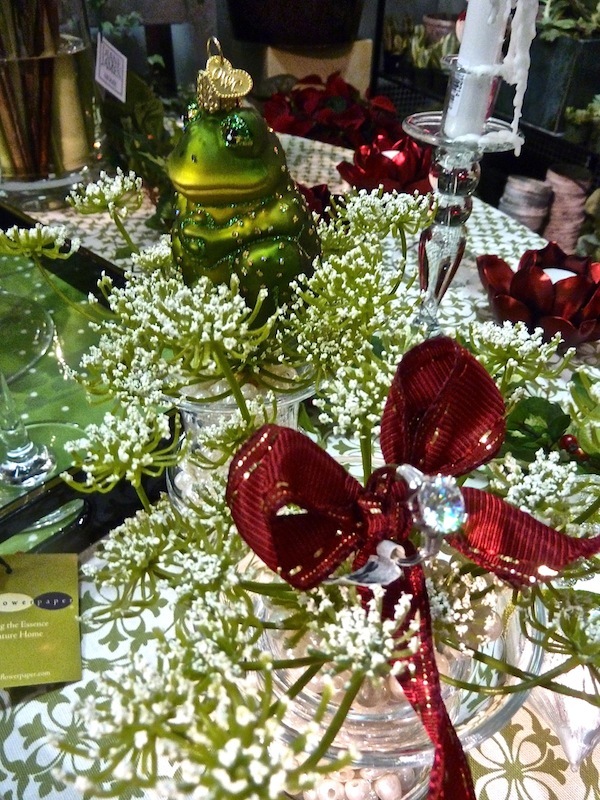 I love all white for the holidays and maintenance free can be especially appealing during this hectic season. And Diane pointed out a little fun she had with her frog prince ornament and faux engagement ring. 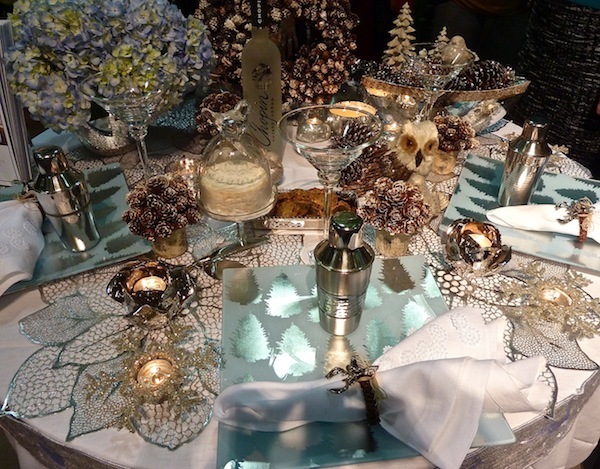 Designer Elissa Grayer‘s table was again metallic but with tones of ice blue and warm pops of brown. The tiny pine cones are adorable and I liked the addition of the blue hydrangea even though they aren’t seasonal. 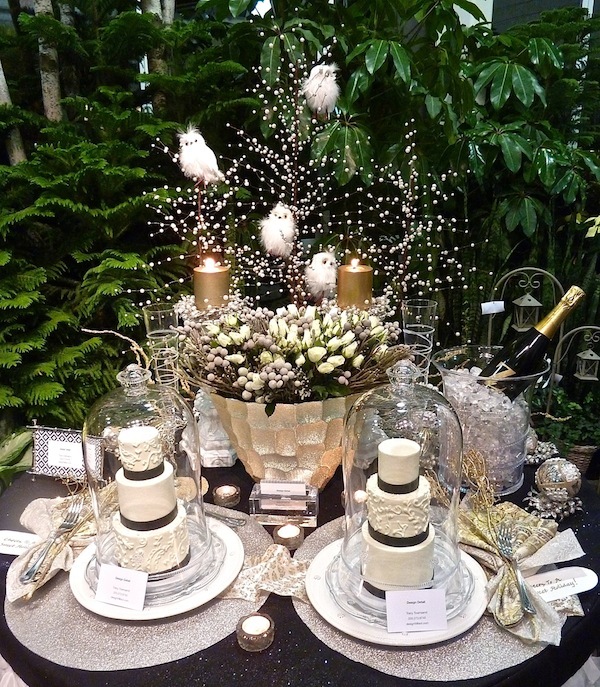 Local designer Tracy Townsend’s white and gold table looked lovely against all the greenery. I adore cloches – they make such a pretty statement – but I’m not quite sure where I would store them all! 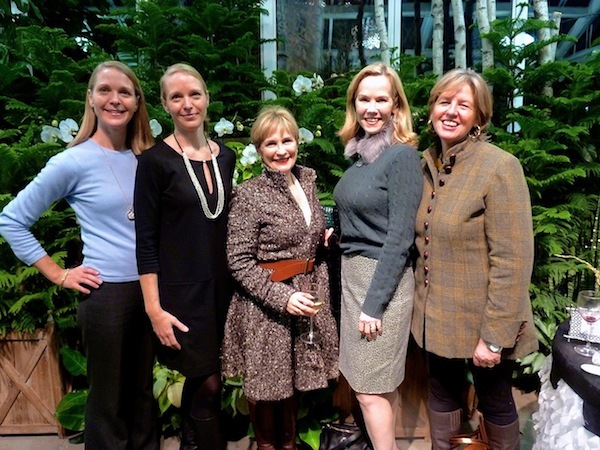 The media partner for the event was Connecticut Cottages and Garden and I got a quick snap of a few friends with editorial director D. J Carey, on the far right – from left, Cynthia James Matrullo and Carolyn James McDonough of Diane James Home, designer Carey Karlan of Last Detail Interior Design and designer Catherine Cleare. What a fun way to kick off the season! I’ll certainly consider adding a little glimmer to my holiday decor this year! This entry posted in design, interior design. 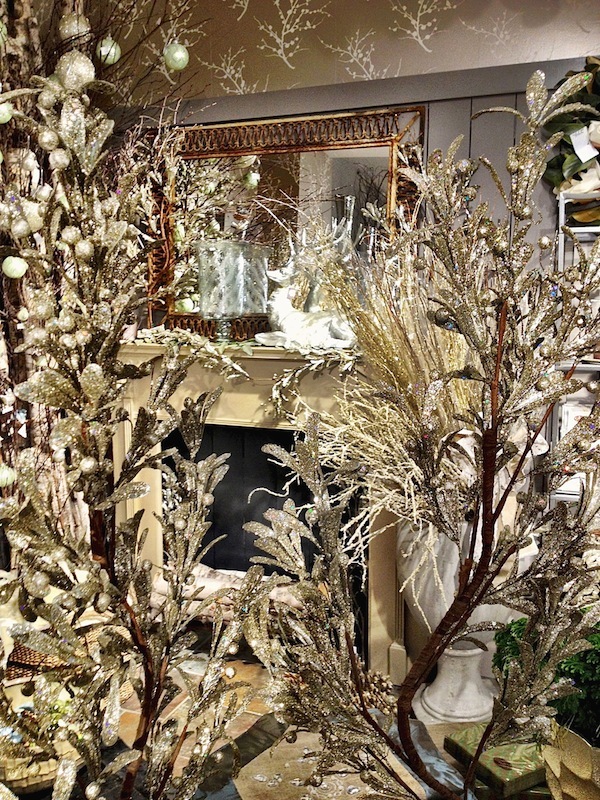 Entry Tags: Connecticut Cottages and Gardens, Holiday decorating, Holiday tabletop, interior design, Last Detail Interior Design, Nielsen's Florist, Tracy Townsend Design Bookmark the permalink. I’m in love with the frog. 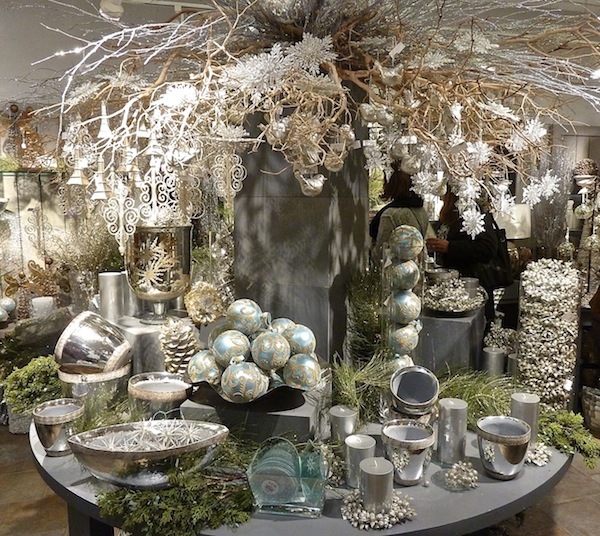 These are gorgeous tables–I just can’t quite believe that we are that close to Christmas. Have a wonderful week-end. This is a great way to start the holiday season! Absolutely stunning tables, and I was happy to see the work of the talented Diane James present. Wow, so much holiday magic here. Looks like a splendid event. 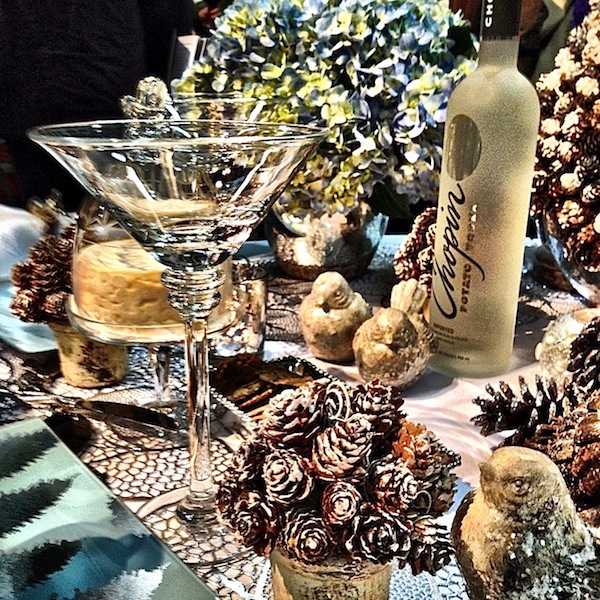 I especially love white and a little sparkle during the holidays and see lots to be inspired by. And it’s always fun to see the James girls! I wish I could have been there. Happy weekend, Stacey! You have the best pictures of the evening and we’re so happy you came! Absolutely beautiful! Each table was beautifully done. The cloches were the perfect piece! 78 queries in 0.419 seconds.